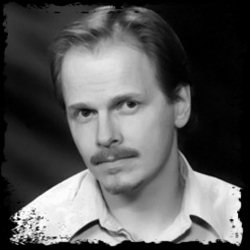 Jeffrey Thomas is the author of such novels as Letters from Hades, Monstrocity and Everybody Scream! and the short story collections Unholy Dimensions, Aaaiiieee!!! and Punktown (all of which can be found at online stores like Amazon.com and Shocklines.com). A story from Punktown was reprinted in an edition of The Year’s Best Fantasy and Horror, and a German translation of Punktown features cover and interior art by Alien designer H. R. Giger. Thomas lives in Massachusetts, and has a wife, Hong; a son, Colin; a dog, Tia. In July 2006, Jeffrey Thomas’ novel A Nightmare on Elm Street: The Dream Dealers will be released in stores. As part of Black Flame’s Nightmare on Elm Street novel series, Jeffrey’s novel will continue the Nightmare mythos in an all new story! Jeffrey has kindly taken some time to answer some questions about self publishing, his new novel The Dream Dealers, how he began writing and more. NOES Companion: What inspired you to become a writer? Jeffrey Thomas: Well, there’s the likelihood that it was genetic; my Dad wrote poetry, and in his later years he had a lot of it published in local newspapers, and my Mom had her own newspaper column when she was a young woman. Not to mention that my sister Wendy used to write a newspaper column, my brother Craig has had some stuff appear in print, and my brother Scott is a dark fantasy author with a number of critically acclaimed books of his own. I guess I started out as more of an artist as a kid (my Dad was a painter, too), and that evolved into my own little comic books, but I don’t think the pictures were the equal of my ideas, so after a while the words just took over. Though I sometimes return to art, in order to do the occasional illustration or book cover. How do you work once you have a story in mind? Up until recently my approach was always very organic, unstructured, in that I didn’t use an outline and often didn’t know too much about where the plot would ultimately take my characters. I put my trust fully in my instincts to get from point A to point Z—though I might fill pages with notes to help give me guideposts along the way. And somehow that process worked. But part of the requirements for my novel A Nightmare on Elm Street: The Dream Dealers was to initially show my publisher a synopsis and a full, chapter-by-chapter outline in order to have the book accepted. Until I began developing pitches for this publisher, I had never even tried writing an outline before, plotting a novel in such depth ahead of actually writing it. I wasn’t sure I could even do it! But when I wrote my first pitch for them, I was surprised at how naturally it came to me. After all, an outline of this kind is really just a story in itself, but cut to the bare bones. So the same instincts that I’d always relied on before served me in a similar way. What do you consider the necessary ingredients for a good story? I don’t think my answer will be too unexpected, because the necessary elements for a good story haven’t changed much since the time of Greek myths, and maybe since the time cavemen squatted around a fire. Just like then, before the time of printing presses, you need a compelling prose voice to get your reader to lean forward and listen closely, and stay involved until the end. You need to take them down a path with interesting things to see and bear witness to. That’s the plot-line, and the line should not be a straight one, but twisty and turny, with carefully spaced valleys and peaks of action. And it’s vital that you breathe life into your characters, instead of making them flat, generic caricatures of human beings. Without having to give a long-winded history of each character, they should still carry a sense of their own past, present, and future. They should seem to contain their own complex psychology, instead of the lazy shorthand or disinterested clichés that some writers rely on to sketch in their characters. Believable characters you can actually care about and a solid writing style will get a reader to follow the plot just about anywhere. Tell us about your new novel A Nightmare on Elm Street: The Dream Dealers. The story takes place a few years in the future, and there’s a new iPod-like device that’s all the rage, almost like an addiction. This is the TranceBox, and it enables people to vividly experience the recorded memories of other people, right down to every last sensation. And TranceBoxes can also play back the recorded dreams of other people, for an even stranger form of entertainment. Our young protagonist, Devon, has an older brother named Alex who works at a research facility where they’re studying odd tumors found on the preserved brains of Freddy Krueger’s past victims, these tumors having developed on the part of the brain associated with dreams. Using experimental technology, Alex manages to extract fragments of dream memories from these preserved brains. When he tries out the recordings for himself, he realizes that these bizarre nightmares could be marketed as a thrilling new program for the TranceBox. In his spare time, Alex moonlights for a software company that produces programs for the TranceBox, so he begins developing the project there. When he has a prototype disk ready, he gives copies of it to Devon and a group of his friends so they can try it out and give him feedback. The kids relive the freaky nightmares of Freddy’s former victims, and become introduced to the knife-handed Dreamstalker. In no time, as Freddy is “remembered” back into existence and grows steadily stronger, the kids start to suffer dangerous new dreams of their own. Meanwhile, one of the kids plans on making the nightmare program available on the Internet as a free pirate download. If she’s successful in this, millions of people across the world will be vulnerable to Freddy Krueger’s evil influence. And I did indeed work hard to make Freddy evil and frightening in this book. Yes, he has a nasty sense of humor, but it’s a superior and taunting sense of humor like the demon in William Peter Blatty’s novel The Exorcist, as opposed to stand-up comedy. Freddy is a powerful being, and he’s smugly self-amused about it, but not goofy. And I was careful to balance out Freddy’s appearances, so that he isn’t popping up on every other page—watering down his impact—but at the same time, he isn’t absent to the point where the reader will grow impatient for his return. How did you become involved with Black Flame’s new Elm Street novel series? Well, Black Flame was aware of me because of my previous work, especially my novel Monstrocity, which had been nominated for a Bram Stoker Award. They wanted to approach new writers like me to try their hand at giving a fresh spin to New Line’s franchises, such as Freddy Krueger, Friday the 13th’s Jason and the futuristic Jason X. I ended up primarily working with associate editor Mark Newton, who is just a delightful guy, very friendly. Mark had some very good ideas to help give me a bit of a springboard for jumping into the pool. For instance, since Mark knows I’ve combined elements of science fiction with horror in the past, it was his idea that I try setting a ANOES novel a couple years in the future. I really ran with the ball from that point on, and it was a load of fun. When New Line green-lighted the Black Flame pitch for The Dream Dealers, I was vacationing with my son in Disney World, and I received the good news in an e-mail. Later that day my son and I went on the Great Movie Ride, and at the end of it you enter a theater and watch a series of clips from classic movies. One of the brief images was Freddy Krueger. Seeing him up there on that screen filled me with the greatest glow, because I knew that soon I’d have the honor of putting that pop icon through his paces. Were you a fan of the Nightmare series prior to writing this novel? If so, do you have a favorite film? Oh yeah; I can’t imagine being a horror writer and not loving A Nightmare on Elm Street. They’re all enjoyable, of course, but as far as favorites it would definitely be a close tie between the first film and Dream Warriors. The third film took the story further, was truly scary, added a very cute Patricia Arquette, the very likable actor Craig (Body Double) Wasson, and brought back the adorable Heather Langenkamp, who I have a crush on to this day. Sigh. My first wife resembled her a bit; I don’t know if that was a subconscious contributing factor in my marrying her. More recently, I found Freddy vs. Jason very intriguing because of the whole concept of Freddy needing to be remembered in order to regain and maintain his power. I really went to town with that concept in The Dream Dealers. Can you give us some background regarding your Necropolitan Press? Necropolitan Press is a small, independent press that I developed in 1992. At that time, I released the first issue of a publication called The End magazine, which featured horror stories, poems and artwork. Some of the writers I published, like Charlee Jacob and Gerard Houarner, have gone on to write mass market horror books for Leisure. I published four issues of the The End, plus a number of other chapbook-style anthologies and single-author collections by brilliant writers like W. H. Pugmire and Jeff VanderMeer. I published VanderMeer’s novella The Early History of Ambergris, which went on to become a part of his highly acclaimed book City of Saints and Madmen. What do you find the most challenging: writing or publishing? Why? Writing is far more challenging, because publishing is more of a mechanical process, and I think that comes easier than the artistic process. Well, my artistic instincts are second nature, like I say, but that doesn’t mean I’m not careful in the execution of my craft. The most challenging thing about publishing is making money at it! That financial challenge, and my far greater desire to write my own work instead of publishing other authors (sorry! ), led me to move away from Necropolitan Press. But there is a chance I might resurrect it for the occasional project; time will tell. It’s a gratifying feeling, putting a book together from scratch, working with the artists, getting it back from the printer and holding it in your hands, seeing positive reviews come in. And though I must, of course, concern myself with my own career over those of other writers, it’s still rewarding putting another writer’s work out there in the public eye. One can read about my past projects with Necropolitan Press, and all my own books, at my new web site www.jeffreyethomas.com. You have many works available for fantasy and horror fans. Which of these would you recommend to Elm Street fans? Why? I’d recommend all of them. Heh. What attracts people to ANOES is the highly imaginative content that the premise of the movies, with their emphasis on dreams, makes possible. I’ve tried to make my own body of work exceptionally imaginative, and very visual to the reader, so as to avoid tired and stagnant approaches to the genres I work in. But I can recommend certain of my books more specifically, with the ANOES afficionado in mind. I have a number of short story collections (for those times when the reader wants to gulp down a nice quick snack instead of sitting down to a heavy, full-course dinner), and my collection Aaaiiieee!!! features a very diverse offering of my work; everything from eerie supernatural stories, to gory and nasty horror, to the weird and experimental. It’s a real horror buffet, that book. And as far as novels go, let me suggest Letters from Hades. Much of the ANOES action, in the films and books, takes place in the Dreamscape, and Letters from Hades has something of that feel, in that all of its action takes place in a nightmarish environment where things seem familiar one moment and then totally screwy the next. Only in this case, the nightmarish world is Hell itself. And lastly, what upcoming projects should readers be on the lookout for? The trouble with upcoming projects is that sometimes they’re uncertain, so I can’t elaborate too much until—or unless—things gets more concrete. I will confess that my novel Letters from Hades has been optioned for a movie, itself. But we shall see what we shall see. And I will say that there could be a few more mass market books out in the near future. From the independent press, we’ll be seeing a kind of sequel to Letters from Hades, and more of my popular Punktown work, which revolves around a very strange and dangerous far-future city. I have a book coming out called The Sea of Flesh and Ash, which contains two short novels, the other by my brother Scott Thomas. It was written before I did The Dream Dealers, but it also involves a kind of alternate universe accessible through dreams. And readers in other countries can anticipate some of my books being translated into German, Russian, Greek and Chinese. That’s all a part of my plan to conquer the world. With Freddy Krueger in my corner, it might just be possible. The NOES Companion would like to thank Jeffrey for his time. Be sure to pick up your copy of A Nightmare on Elm Street: The Dream Dealers. You can also see more of Jeffrey’s works by visiting his website here.